The National Mobile Shower and Catering Association is requesting exemption from six HOS provisions, according to a document published in the Federal Register on Nov. 27. The association provides mobile food and shower services for emergency responders during natural disasters. For example, services include trailers that are furnished with shower units. Extend the 14-hour duty period to no more than 16 hours. Exclude “waiting time” while not performing duties in the calculation of the 16-hour duty period. Not comply with the minimum 30-minute rest-break provision. Extend the maximum 60 hours on duty in any seven-day period to 80 hours on duty in any seven-day period. Extend the 11 hours of driving time to 12 hours. A resource order is issued by a federal agency and tasks firefighters and supporting personnel with responding to emergencies such as forest fires. Member companies involved in transporting food and water services to federally contracted forest firefighters who have set up base camps submitted the exemption request. 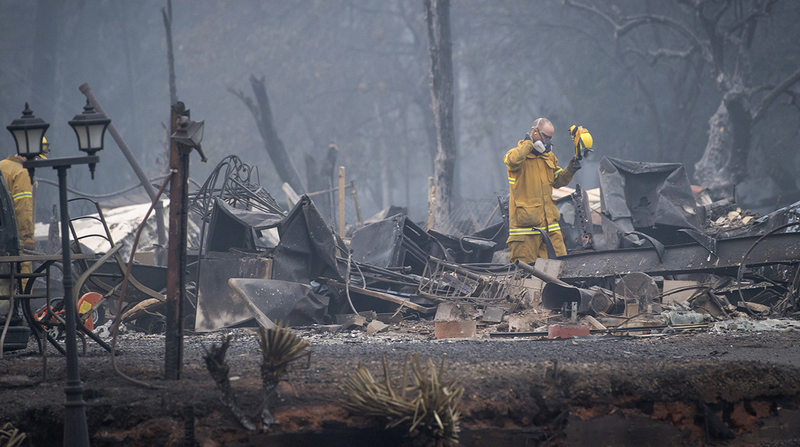 The request was submitted as first responders quell the Camp Fire and the Woolsey Fire, two recent deadly and destructive wildfires in California. The exemption, if granted, would apply to about 30 member companies located in the western states. In the document, the association claims their members usually travel relatively short distances and generally don’t exceed 5,000 miles per year. The nature of mobile shower and food service hauling is unpredictable. The notice mentions that, unlike firefighters, the association does not qualify for the exemptions pertaining to those who haul emergency equipment. This means that firefighters may have little access to food or showers until association members arrive at base camps. “The exemption is needed both to expedite response to the scene of an incident and to allow HOS flexibility for the crews while operating for days at the base camps,” the document states. If granted, the exemption would be in effect for the period in which the National Mobile Shower and Catering Association is operating under a resource order. Those operating under exemption must provide proof that they are working for one of the association’s member companies. The association previously received a 90-day exemption identical to the one they are requesting now. That exemption expired Oct. 24. FMCSA is welcoming public comment on the request through Dec. 27. The National Mobile Shower and Catering Association’s request appears in the Federal Register the same day as FMCSA’s announcement that it will renew an HOS exemption for the Specialized Carriers and Rigging Association. The association specializes in moving machinery, millwrighting and crane operations. FMCSA announced it will renew the association’s exemption from the 30-minute rest break rule for another five years. The exemption pertains to all motor carriers and mobile crane operators with a lifting capacity of 30 tons or more. FMCSA’s decision prolongs an exemption granted in November 2016, which the association fought for on the argument that such rules make it difficult for crane drivers to find parking without violating HOS limits. While parking availability is an industrywide issue, the association claims that parking for crane operators is even more limited because of the equipment’s size. Moreover, the association states that timing a crane’s movement from work sites onto public roads is difficult because of inclement weather and construction delays. FMCSA has been receptive to many requests for exemption from HOS rules. The agency granted an exemption to Waste Management Holdings Inc. on Oct. 25. In September, the American Concrete Pavement Association requested exemption from the 30-minute rest-break provision and the shorthaul requirement. Four environmental service companies on Aug. 9 petitioned for a five-year exemption from HOS regulations for drivers involved in providing direct assistance in environmental emergencies.